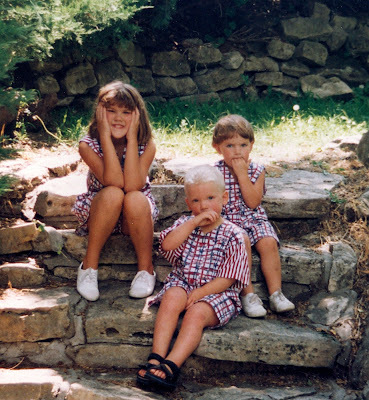 One year for the 4th of July, my Grandma Hillbilly made the kids matching outfits. And your expectations seem a little high. I can't remember everything. Is there anybody out there who might want to guess what year this was? Hmmm....anybody?? And yes, I have an ENTIRE photo album of them in these outfits. I have put it in an extremely safe place. Yep. I can't find it. But the silverware drawer is clean. Just sayin'. I think Frick & Frack are 3, because they look like they do in the picture I have of them with Whatshisname outside of Rosalee's before their 1st day of preschool. Maybe? That would make College Girl, what, 7?